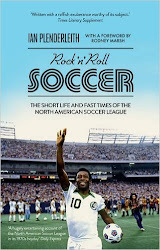 ROCK N ROLL SOCCER: "They couldn't play in the fourth division in England"
"They couldn't play in the fourth division in England"
Chapter one of Rock n Roll Soccer (‘Atlanta, Champions of England’), not only covers the difficult inception of the North American Soccer League in 1968 - the result of a merger between two rival professional leagues that had started up in 1967 - but also the extraordinarily gruelling tour of newly crowned English champions Manchester City to Canada, Mexico and the United States. In May 1968, City played one of the NASL’s more promising new teams, the Atlanta Chiefs, in a friendly game that caught the imagination of local fans. City lost 3-2, but when two subsequent games in Mexico were cancelled, they opted against an early return home in favour of returning to Atlanta to try and beat the Chiefs at the second attempt. Manchester City’s assistant manager Malcolm Allison didn’t take his team’s defeat to Atlanta well. Prior to the game on 27 May 1968, he had been sanguine, while the local media touted City as champions of England and thus possibly the best team in the world – a deductive leap that, in the name of publicity, few in either camp would have bothered to dispute. ‘The stadium is a beautiful facility and the pitch is fine with us,’ Allison said. ‘It won’t make a bit of difference to us play­ing on part of a baseball infield. It’ll be just like playing on a frozen field in England. And we’ve played in all kinds of condi­tions.’ He even pre-empted excuses about City struggling after a long, hard season, because it just meant ‘we really don’t need that much practice’. One of my favorite Atlanta sports stories of all time. Beat them the second time too!